Sleek, simple, yet sophisticated, the Tag Heuer Men’s CAP2112.BA0833 Aquaracer Chronograph Watch is a timepiece of ultimate quality and precision for a man who needs an attractive diving watch he can wear everyday. Tag Heuer, the fourth largest luxury watch brand, known for its Swiss craftsmanship and its particular involvement with sports, is already a good choice when it comes to sports watches. Take a step further with the Aquaracer collection, which has been designed and developed by professional divers. This Aquaracer Chronograph Watch CAP2112.BA0833 boasts both a bold, streamlined style and superior technology. With its indigo striped dial, and silver stainless steel bezel, case, and bracelet, the watch has a masculine, sporty look that is also. In addition, the large, luminous silver hour, minute, and second hands, luminous raised silver hour markers, and white minute and second demarcations make it easy to tell the time. Black Arabic numerals on the bezel for 10, 20, 30, 40, and 50 minutes also add functionality and style, while the date display and three sub-dials displaying 12 hours, 30 minutes, and 60 seconds also help measure time more precisely. But perhaps one of the most impressive features of the watch is its water resistance, which goes up to 1,640 feet (or 500 meters), making it suitable for scuba diving to a depth of 50 meters for up to two hours. However, this watch may not be for every man out there. 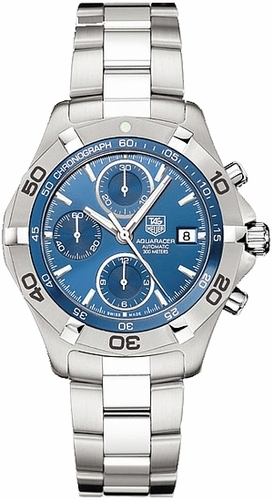 Some may desire extra functions of other Aquaracer models, that have an automatic helium escape valve to regulate pressure, a double security clasp bracelet, a magnified display window, a rubber strap, or a black and silver look; for these, you may want to consider the 500 m Calibre 16 Automatic Chronograph 44 mm series, or the 500 m Calibre 5 Automatic Watch 43 series, both on Tag Heuer’s Web site. Finally, there is the hefty $2,700 price tag, but considering that Tag Heuer is the fourth largest luxury watchmaker out there, known for its aquatic sports watches, you will be sure that you are getting a quality-made watch. Also, because it is an automatic chronograph watch, which are more expensive and more durable than digital chronograph watches, you are getting what you’re paying for. 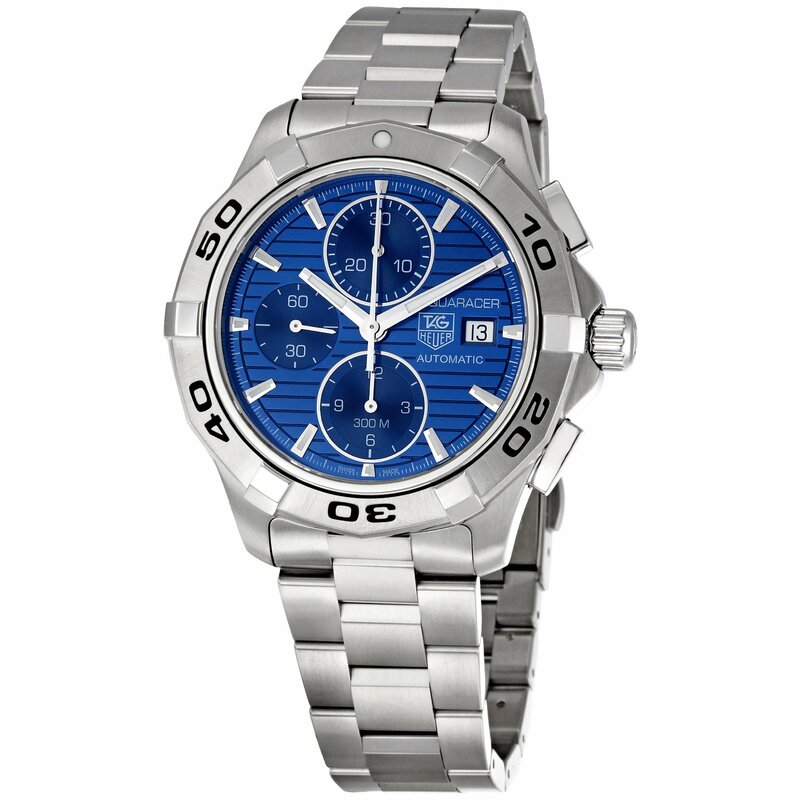 If you’re looking for another blue dial Aquaracer, try the Tag Heuer Aquaracer Automatic Chronograph Men’s Watch CAF2112.BA0809. With a lighter blue-colored dial, additional minute markers on the inside of the dial, and a whiter silver middle stripe on the bracelet strap and bolts on the bevel, it has a busier but still elegant look. 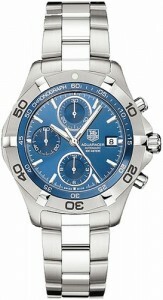 Among diver’s watches, the Tag Heuer Men’s Aquaracer Chronograph Watch CAP2112.BA0833 is a solid pick. The only downside may be that it doesn’t have a double security clasp, but the double push button does seem to afford some security. With superb Tag Heuer craftsmanship, precise chronograph functions, easy readability, and a sleek blue dial design (one of the few among the Tag Heuer collections), the CAP2112.BA0833 is a highly recommendable watch to purchase. Been using this watch for 4 years and haven’t had any problem whatsoever. The watch is very reliable and so far it has been a really good experience.